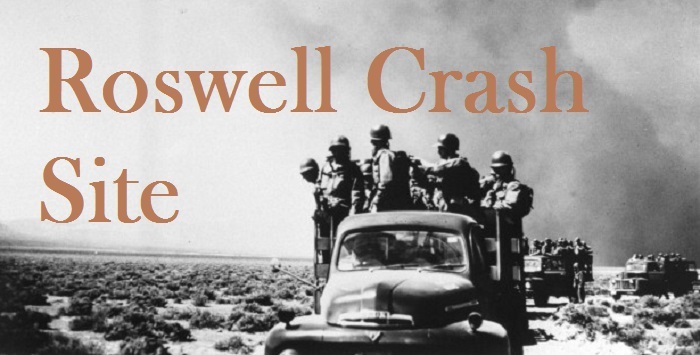 As usual, Kevin Randle’s blog was full of Roswell commentary. Some of it is the same old stuff being recycled. Eventually, he brought up Jesse Marcel Sr. I think it was good that Kevin summarized a lot of the early interviews with Marcel. While I have presented many of these in the past, the quotes from the interviews conducted with Marcel in the movie “UFOs are real”, which never appeared in the film, were very interesting. They paint a picture of Jesse Marcel, insisting that he had distributed some of the materials, from his recovery, onto the floor in Ramey’s office. In the final production of the film, this was missing but, in one section, they have Marcel stating, “The newsman saw very little of the material, very small portion of it. And none of the important things, like these members that had these hieroglyphics or markings on them”. Like many of the early quotes attributed to Marcel, it seems that he believed that the press saw some of the materials before the infamous “switch” supposedly occurred. I suspect that proponents will say that Marcel confused the public relations officer as a member of the press. This sort of disagrees with the theory that Marcel was not a drooling idiot and could never mistake a radar reflector for a “crashed disc”. In this case, Marcel did not know the difference between a military officer and members of the press! Of course, these same people, who proclaim that Marcel was not a drooling idiot, also suggest that Ramey must have been because he let the press photograph a TOP SECRET document. Now we know it is different than the BeWitness being. Two pictures came up recently. This black and white picture from 1986 from the national park service and another photograph by Frank Hadl in 1956. They are different from Palmer’s original mummy. Watch the black and white picture from 1986. It’s not the same corpse from Palmer’s mummy. The black and white photo was actually taken in 1896 and not 1986. This was taken shortly after the body was removed from its discovery location. This error aside, I find it interesting that Maussan is stating that the body in these two photographs is the same as the BeWitness body. The implication is that there was a switch of the body at Mesa Verde with an alien body from the Roswell crash. One has to wonder how they got an alien body in 1896. Of course, this argument contradicts the one made by Maussan’s experts on October 26, 2015. In that presentation, the experts stated that the 1896 photograph was of the mummy and that it could not compare to the BeWitness body. The confusion between Maussan’s presentation and the October 26 arguments makes it clear that Maussan is trying desperately to come up with some sort of scenario that explains his failure in regards to the Roswell slides. Last issue, I described how Maussan’s Roswell alien scientists had written a report about the Roswell slides body. Their conclusion, as expected, was that the body was not a mummy. Their web site disappeared in just a few days. Now, one of the authors, Biol- ogist José de la Cruz Rios Lopez, is promoting the story on another web site.1 He sent me a link to the web page, which prompted me to e-mail him links to issues of SUNlite. What transpired over the next few hours was an exchange that indicated to me that Rios was “all in” and not really interested in either examining the case critically or discussing it with those outside his little circle. Jose Rios and I argued back and forth several times but his main arguments appeared to be that the body in the Ray photographs was not the same based on his own analysis of the images from 1896 and the slides. Rios used his own argument from authority as the final word. I would be willing to accept this if he actually attempted to discuss the issues. Instead, Mr. Rios simply gave blanket statements and appeared unwilling to examine the possibility that he made any mistakes. Rios states that the study has been subjected to peer review by INACIFO. The problem with this is that INACIFO is not an indepen- dent agency. They had endorsed the slides as a non-human body before the placard was deblurred. Either they had to admit they had made some gross errors in their analysis or attempt to justify their initial flawed analysis. It appears they are doing the latter. Rios added that his article was to appear in..... a magazine! I supposed the MUFON journal or some tabloid will be glad to publish the story but they usually will publish anything that sells. There is little, or no, review involved with such analysis. What I was looking for was for him to actually submit his analysis of this “non-human” body to an actual journal, where actual experts, outside of the Maussan circle, can properly analyze his findings. If his findings are correct, then this discovery should be shared with the rest of the scientific community. If Rios can not, or will not, publish in such a journal, then one must draw the conclusion that there must be something wrong with his analysis. José de la Cruz Ríos López felt my analysis of the body’s length was incorrect. According to him, the woman is so close to the body, that she can be used as a measuring tool to estimate the body’s length. I tried to describe to him the reason the woman was out of focus was that she was outside the depth of field but he was insistent that the woman was only “a few CM” away from the body. This is not true and is clearly seen in the photograph. The woman is separated by the body by at least one glass shelf width. Glass shelves of this type are probably 8-inches (20 CM) in width. Because the body is on a second shelf, that means the distance between the body and the edge of the rear shelf was 12-inches (30 CM) or more. That is only the distance between the body and the rear shelf edge. The woman is obviously further away from the shelf. Putting her at the shelf’s edge is more wishful thinking by Rios than actual objective research. It is hardly “a few CM” and demonstrates that Rios length of the body calculation is wrong. Mr. Rios was insistent that the body was “fresh” based on his observations of the slide. I countered with the comments from all the anthropologists Philip Mantle had contacted. They all agreed the body was a mummy of some kind. Rios seemed to be unaware that so many anthropologists had rejected his observations. He stated that he would try and contact these individuals but I have to wonder if he will. The only anthropology experts he seemed to be interested in listening to are Dobles and Carey, who are far from objective. posed to some damage/changes in handling. be more/less clear in the other. • The body is photographed from two different perspectives and under different lighting conditions. thinks this means there is no right hand but he misses the obvious. The right arm appears to be rotated 90 degrees. There appears to be, the thumb and two of the fingers visible. The repositioning of the arm also makes the forearm appear different. The cloth found with the body was draped over the body differently. It hides certain parts of the body and gives the impression that certain areas are different. In Rios interpretation of the right “hand”, parts of the hand are apparently hidden by the cloth, which makes that part of the body appear incomplete. In the Ray slide, the right arm is partially obscured by the cloth as well giving the false impression the arm is thin. 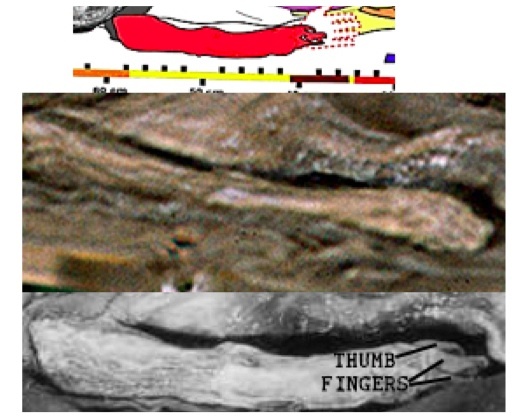 Ignored by Rios is the fact that the body is VERY similar to what we see in the Palmer mummy. • The shape of the body is the same. • They are both missing the right leg. • They both have the cloth wrapped around them. • The head and mouth are essentially the same. While he can find apparent differences in the imagery, which leads him to believe they are two different bodies, Rios ignores the obvious. He is stating that this non-human body looks a lot like the mummified body of a two-year old boy! Jose Rios used this gem in our e-mail exchange and I chuckled at his acceptance of a story that can not be proven to be true. He is referring to Eleazar Benavides, who is has a personal interest in promoting the Roswell crash. His testimony is suspect. How can Rios tell if Benavides is telling the truth or being accurate? As a biologist, does he accept observations of Bigfoot, Chupacabras, or the Loch Ness monster as well? Roswell is full of “witnesses”, who have made all sorts of claims and were later discovered to be not telling the truth. An actual scientist would understand the problems with such testimony and recognize it carries little or no weight. Rios seems to be one of those UFO scientists, who will discard skepticism in order to promote his own interpretation of the data. The Rays had photographed the body in New Mexico after July of 1947. This was another of Rios’ flawed arguments. There is absolutely no evidence the slides were taken in July of 1947. The best anybody could estimate was that they were taken in the mid to late1940s. The Ray photograph collection contains few, if any photographs, from New Mexico. However, there are several of 1940s collection that show locations in Colorado. I pointed this out in SUNlite 7-3. Assuming the photographs of the body were taken in the same time period, then it is likely these photographs were taken at Mesa Verde, which is located in Colorado. Rios seemed completely ignorant of all of this and, instead, seemed insistent that the body had been moved to Montezuma’s castle by the time these photographs were taken. The move did not occur until June of 1947. Since the slides can only be dated from the 1945-1950 time frame, then it is very possible the photographs were taken PRIOR to June of 1947. Rios has since tried to refute my comments from SUNlite 7-4 and proclaim them as false.2 However, he does not address the im- portant points and cherry picks data to attempt to show where I was wrong. Most of his arguments are based on what I have written here. He refuses to answer any questions about his measurement of the body length. Meanwhile, Jaimie Maussan is promoting the idea that the only “scientific study” of the slides has proven they are images of a non-human body.3 What Maussan fails to tell everyone is that this “study” has not been validated because it has not been presented to a journal of anthropology, where experts, outside of Maussan’s inner circle, can evaluate their work. Anybody can post stuff on the Internet and proclaim it as scientific proof. Without independent verification of their work, by qualified experts, this report fails. I once again, challenge Maussan’s “experts” to put their scientific reputations on the line and publish their work in an independent journal that can evaluate their work properly.